The New Humanitarian | Iraq 10 years on: Are the taps flowing? Iraq 10 years on: Are the taps flowing? For much of the past decade, Iraqis have cursed about two things: ‘maya’ and ‘kahraba’ - water and electricity. These are more than petty complaints; they have become a benchmark by which Iraqis judge progress in their country. A recent survey by the National Democratic Institute (NDI) found that 42 percent of 2,000 Iraqis surveyed considered basic services - like water and electricity - among the top two concerns they want the current government to address. In 2011, more than one-quarter of the population had access to water from the general network for less than two hours a day, and nearly half the population rated the quality of water services in their area as bad or very bad, according to the Iraq Knowledge Network (IKN), a survey of nearly 30,000 households conducted by the Ministry of Planning’s Central Statistics Organization, the Kurdistan Regional Statistics Office and the UN. According to the UN, most Iraqis have limited access to clean water because of poor infrastructure maintenance and inadequate funding of the water supply system. One-fifth of Iraqis relied on bottled water as their main source of water, and only one-fifth of people had access to water from the general network all day long, the 2011 IKN survey found. The state of disrepair forced significant numbers of people into using river water, despite the health risks, IRIN reported in 2007. Still, statistics appear to show that access to clean water has improved in the last decade. 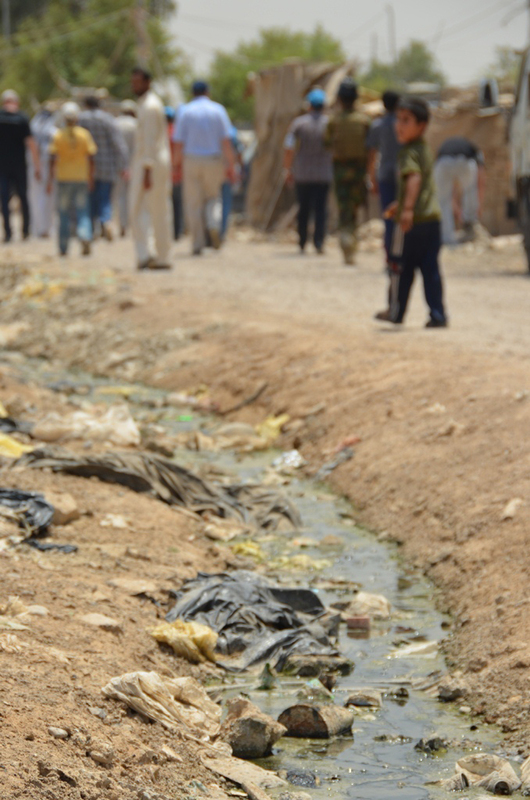 In the 1980s, more than 90 percent of Iraqis were estimated to have sustained access to clean water. By 1990, this percentage had dropped to 81 percent, according to the government. Since, then, according to the UN Children’s Fund (UNICEF), the percentage of households using an improved water source, including bottled water, has risen from 83 percent in 2000 to 91 percent in 2011, after a drop in 2006. The percentage of Iraqis with access to improved sanitation also rose from a government estimate of 71.5 percent in 1990, to 92.5 percent in 2000 and 93.8 percent in 2011, according to UNICEF. But experts warn that statistics vary significantly by region, and some Iraqis perceive there to be discrimination by sect. Just as deposed former president Saddam Hussein politicized service delivery, the current Shia-led government is seen, by some, to provide preferential service to Shia communities. In recent months, for example, large-scale protests in Sunni-led provinces have been partly inspired by dissatisfaction over service delivery in Sunnis areas. For some, like Mustafa Ahmed, a father of two from Baghdad, the change in service provision has been negative. He told IRIN that, before 2003, he could get clean water from the network, but now he has to buy bottled water. Meanwhile, water levels in Iraq’s rivers, lakes and reservoirs have decreased to “critical levels”, according to the UN, with the two main sources of surface water - the Tigris and Euphrates rivers - down to one-third of their normal capacity. Resulting water shortages have affected Iraq’s previously almost self-sufficient agricultural sector, which is now depressed and underproductive, the UN says. 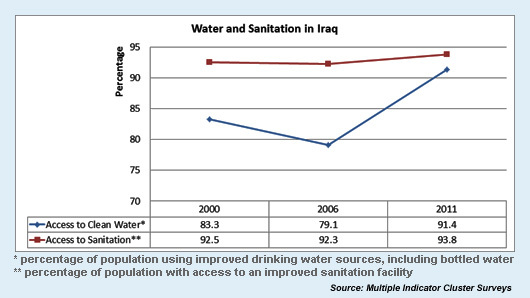 For more, check out this UN fact-sheet on water in Iraq and the Multiple Indicator Cluster Surveys of 2000, 2006 and 2011, which measure access to water and sanitation, among other things.